Classic Car Dealer established since 1979 with a selection of classic cars for sale, plus the sale and purchase of prestige, vintage and sports cars. Keywords: Classic Car Dealer Cars for Sale Vintage Sports British European Cars. The web server with the IP-address 87.76.27.224 used by Classiccarshop.co.uk is run by 4D Data Centres and is located in Great Britain. The website Classiccarshop.co.uk has a own web server. The web server only runs this website. 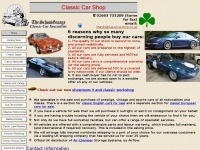 The websites of Classiccarshop.co.uk are served by a Apache server. The HTML pages were created with the latest standard HTML 5. The website does not specify details about the inclusion of its content in search engines. For this reason the content will be included by search engines. The homepage of the website is "/home/".